A mass demonstration is planned in the Vancouver, B.C., metro area Saturday against the expansion of Kinder Morgan’s Trans Mountain pipeline project. Nearly 7,000 Coast Salish Water Protectors have signed up to participate. Building in the courts and halls of Canadian government for years, conflict over the mammoth Trans Mountain tar- sands oil-pipeline expansion is expected to spill into the streets of British Columbia Saturday with massive civil disobedience demonstrations. Indigenous leaders from along the pipeline route and the U.S. are expected to join a march and rally beginning Saturday in metro Vancouver. Nearly 7,000 Coast Salish Water Protectors — as the pipeline opponents call themselves — have signed up to participate, said Will George of the Tsleil-Waututh Nation, spokesman for the Protect the Inlet movement. “We cannot stand by anymore,” George said. “It is going to be like Standing Rock,” where thousands of so-called water protectors stood against the Dakota Access Pipeline in North Dakota in 2016. 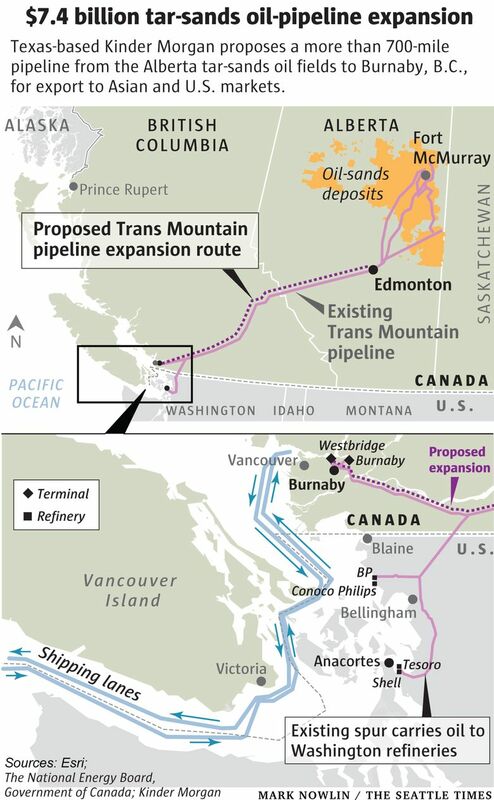 The target is Houston-based Kinder Morgan’s more-than-700-mile-long tar- sands oil pipeline from Alberta to Burnaby, British Columbia, intended to nearly triple the transport of oil from Canada’s interior to the coast to 890,000 barrels a day. Approved by the federal government of Canada in November 2016, opponents vow the pipeline will never be built. Because unlike the resistance to the Dakota Access Pipeline at Standing Rock in rural North Dakota, where the governor called out the National Guard and the local sheriff marshaled an eight-state police force against opponents, this indigenous-led struggle will play out in metro Vancouver with support from local government. The pipeline is opposed by the province of British Columbia as well as the largest cities in the lower mainland: Vancouver, Burnaby and Victoria. There is support below the 49th Parallel as well. Washington tribes, state agencies and conservation groups have fought the pipeline at every stage because its completion would bring with it a sevenfold increase in the number of oil tankers traveling through the home waters of critically endangered southern resident Killer Whales. Whether rooted in concern over climate change, oil spills, species extinction or indigenous rights, the battle lines are drawn. “I expect to see a level of opposition that is equal if not bigger to what we saw in North Dakota in 2016,” said Jan Hasselman, staff attorney at EarthJustice’s Northwest office in Seattle, and the lead attorney for the Standing Rock Sioux in the tribe’s fight against the Dakota Access Pipeline. The expansion project came about in response to requests from oil shippers to help them reach new markets by expanding the capacity of the Trans Mountain Pipeline, said Ali Hounsell, spokeswoman for Kinder Morgan. Its primary purpose is to move crude oil from Alberta to export markets around the Pacific Rim including British Columbia, Washington State, California and Asia. The pipeline expansion has its supporters in British Columbia, as well. “Crude oil in Canada is what pays the rent for us as a country,” said Stewart Muir of Resource Works Society, a nonprofit funded by the Business Council of British Columbia. Muir will help lead a pro-pipeline rally in downtown Vancouver to push back against the demonstration on Saturday. Canadian producers deserve a crack at overseas markets with better prices than the U.S., he said. Completion is planned for December of 2020 for the $7.4 billion project, which will duplicate an existing pipeline that has been in operation since 1954. Hounsell said the company is well aware of the coming demonstration and respects the rights of opponents to peacefully demonstrate. “That’s what it means to be Canadian,” she said. An election in British Columbia since the project was approved by Prime Minister Justin Trudeau in November 2016 has shifted the landscape in British Columbia from support to a lawsuit by the province to stop the project — one of 16 lawsuits pending against the pipeline. “The company keeps saying it is a done deal; it is far from that,” Stewart said. Hounsell countered that in addition to the federal government’s approval, the company has signed agreements with every First Nation in the path of the pipeline. But traditional leaders said indigenous opposition nonetheless remains resolute. “It’s the ongoing proverbial battle between oil versus water,” said Grand Chief Stewart Phillip, an Okanagan aboriginal leader and president of the Union of B.C. Indian Chiefs, a political advocacy organization representing 118 bands and First Nations within British Columbia. Phillip was one of hundreds arrested in 2014 when Kinder-Morgan’s test drilling on Burnaby Mountain drew thousands of protesters and resulted in more than 100 arrests. He said he and uncounted others are willing to do whatever it takes to stop the project.